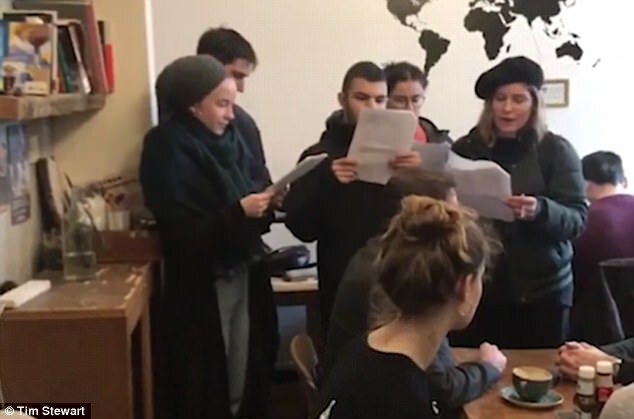 On Saturday in Finsbury Park, North London, a cafe named ‘Blighty Coffee’ was targeted by left wing losers (protestors) who made their case to call the cafe and Winston Churchill out as “racist”. The group of mentally challenged left wing morons consisted of nine virtue signalling idiots who stormed the cafe in Finsbury Park on Saturday to tell customers to boycott the cafe because it “celebrates colonialism”. Hmmmm? Maybe they just serve breakfast, sandwiches and coffee there? Probably also lunch and maybe even dinner? Their parents must be so proud of their total underachievement in life, resulting in becoming left wing morons with nothing to give back to society, except to protest things that make no sense whatsoever. How sad is that? Clearly, if they have a problem with English history, perhaps they should emigrate and return to the countries and cultures where they feel that they belong, rather than attempt at having some purpose in life through a deranged protest, with this completely “dire” attempt at making themselves somehow relevant. This is not British, and shouldn’t be acceptable in Great Britain. Is this Tony Blair’s achievement after his tenure as Labour leader and Prime Minister all those years ago, basically destroying the United Kingdom with his unwitting and consequential repercussions of his foregone policies on immigration? Is it the fault of socialist Marxist tutors in the university and private school systems within the UK in recent years? Is it Jeremy Corbyn’s fault for running a “nothing party”? Or the fault of Sadiq Khan for letting these idiots charge up on ethnic socialism and identity politics, and allow them to try and ban free speech?. The morons chanted, “It is our duty to fight for our freedom?”, not realising that they are already free? Perhaps they should be sent to socialist/communist countries such as Venezuela and North Korea, where they could take up citizenship and claim asylum in a so-called free society? Alternatively, maybe they should be sent to Afghanistan or Iraq to see how they would fend for themselves over there, where the people are not so free? 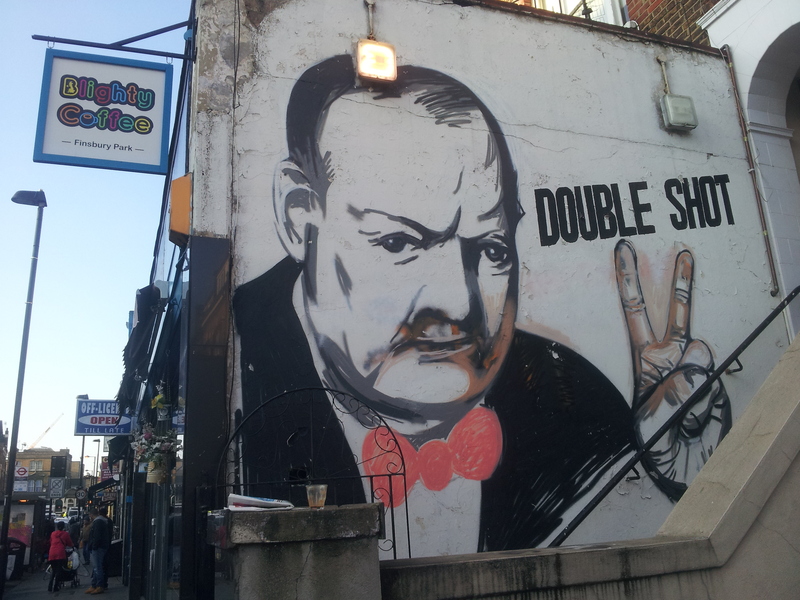 To bother to protest a cafe for having a Winston Churchill theme is to be revered by the left-wing Marxist set, apparently. Perhaps they don’t realise that without history, and without Winston Churchill, the United Kingdom and indeed the whole world, would literally be speaking German right now?! Perhaps they should leave the United Kingdom, since they’re clearly not British with such communist rhetoric. Then as you heard, they chanted, “We have nothing to lose but our chains”. Just which chains would that be exactly? The invisible chains that keep them returning to McDonald’s or Chicken Cottage? Who knows? Perhaps they should just not enter or visit the cafe if they don’t like it? These types of morons are seemingly rife amongst the youth these days. Perhaps, if they think they can ban “free speech” or change history, maybe they should just go back to school where they can get reeducated, and aspire to have some future purpose in life. Of course, these pretend activists have close links to the failing Labour party, however, we thought we’d avoid naming the names of the people and their moronic causes in this article, as we believe that these people are absolutely worthless, and so they do not even warrant being mentioned by name. Alexander Hamilton, present at the cafe that day, tweeted: ‘Just been a reluctant part of some form of anti-Churchill protest at @BlightyUKCafe. They had a script and everything. Could have at least bought a coffee”. Luckily these types of people will not be celebrated or tolerated by educated logical thinkers, you see? As an added bonus, down below, you can watch another interesting viewpoint from some London A-Level students with their brains still very much in tact after visiting a Q&A session with the hugely unpopular London Mayor, Sadiq Khan. Nice! There’s still hope out there, away from those types of left wing Marxists!